Kids as young as 1 can be introduced to numbers though they’ll need to be a bit older before they can start counting objects. Help your child grasp the concept of numbers and counting faster, with this free printable Counting worksheet for kids. We’ve made it more fun by adding colorful shapes that your child can relate to. 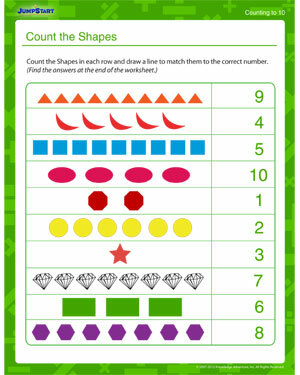 Also check out this Count the Fruits worksheet for some extra practice!